Piles of waste including food wrappers, cardboard boxes and black bags, have been left strewn near a track at Blackhills outside Peterhead. 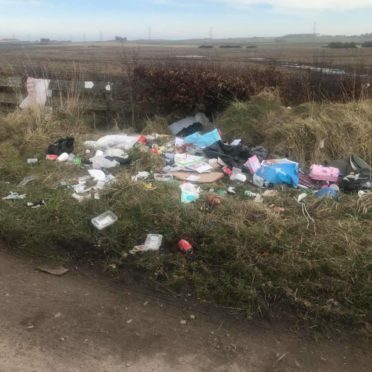 Fly tippers who dumped significant amounts of unsightly rubbish in the north-east countryside have been vilified by community leaders. The popular Boddam Public Hall is regularly hired-out for parties, fitness classes and children’s events. And last night the committee that runs the Church Place facility issued a statement suggesting a previous user of the public space was behind the littering. They have reported the incident to the council and have pleaded with anyone using the hall in the future to place their waste in the correct bin. A spokesman for Boddam Public Hall said: “Sadly a former hirer of the hall has taken it upon themselves to dump waste from the hall out in our beautiful countryside at Blackhills. “This compounded the difficulties they caused by filling our recycling bin with general waste that the council does not collect. “In turn, the hall missed a number of recycling bin collections despite the hirer being advised multiple times to remove it by Boddam Public Hall committee. “This also caused a backlog of waste at the hall. The case is now being investigated by local authorities to stamp out this illegal activity. Boddam Public Hall is encouraging anyone who witnesses fly-tipping or finds fly-tipped waste to report it by calling the Dumb Dumpers hotline on 0845 230 4090.